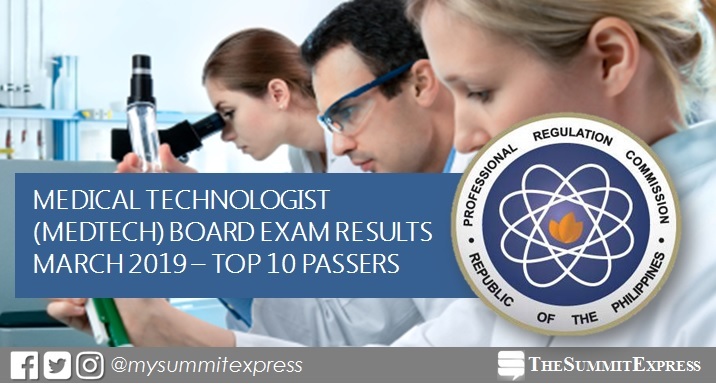 MANILA, Philippines – The full list of topnotchers or top 10 passers in the March 2019 Medical Technologist (MedTech) board exam is available on this page as officially released on Tuesday, March 19 or in three (3) working days after the exam. In the same period last year, Alvin Aurelia Bahin of Remedios T. Romualdez Medical Foundation garnered the highest place with 90.50%. Amabelle Son Marquez of Southwestern University was on second spot with 90.40%. In the February 2017 licensure exams, Vanessa Leslie Rivera of Far Eastern University (FEU) - Manila led the passers with 91.20%. David Marco Abaya Bildan of Saint Louis University (SLU) followed with 90.60%.